As Israel gears up for a massive 70th-anniversary party this Independence Day, I hope it will be ready to receive the greatest gift ever. Did we progress toward a tangible, unified goal? Do our achievements in high tech, science, medicine, and defense truly benefit others? Granted, any nation that has achieved the likes of what we’ve achieved with the means that we have had over the last 70 years would be very satisfied with itself. However, the question remains: should we be measuring ourselves with the same sets of values as other nations? We, the people of Israel, are unique. Whether it’s the Torah describing our uniqueness as a “chosen people” (Deuteronomy 14:2) and as a people who “bring Light to the world” (Midrash Rabba, Song of Songs, Portion no. 4), or the nations of the world pointing it out with increasingly intense anti-Semitic pressure, we are shown that we cannot simply rest on our laurels. On the contrary, we need to be alert to the fact that because of our uniqueness, we are held to a higher standard. Our history, both inside and outside the boundaries of the State of Israel, is tainted with genocide, war, exile, and anti-Semitism. Even today, a UN vote on the existence of the State of Israel could very probably eliminate the State of Israel just as quickly as it was admitted in 70 years ago. Therefore, we need to explore our ideology, our Torah, our history, our destiny, the attitude toward us from all the nations, and then examine whether we are making the right introspection in this special year. Why don’t the same sets of values apply to Israel as they do to other nations? While Israel continues to seek global recognition for its progress in high tech, science, medicine and agriculture, Israel stands for a completely different set of values. Therefore, no matter how much Israel exports cutting-edge technology to the world, the world’s stance toward Israel just becomes all the more bitter and harsh. The Jewish nation was established in ancient Babylon by Abraham the Patriarch. Abraham united the people in Babylon who came to him to join the first ever “unity above differences” movement. People who refused to simply flow with the decadent Babylonian zeitgeist, and who saw the truth in Abraham’s call to “love your friend as yourself” (Leviticus 19:18) gathered around him. Abraham united that first group of people called them “Israel” (Yashar El) (Drush, Ramchal), and guided them to the land of Israel, the land of Canaan. The method Abraham taught is called “the wisdom of Kabbalah.” This is a method that guides people through a process of uniting above differences. Once unity is implemented in one group, it can then spread wider and wider until it reaches humanity as a whole. However, after we returned to the land of Israel, we failed to accept the unifying principle of “love your friend as yourself” as the essential method we needed to continually sustain and grow, that this unifying principle is what identifies us as the people of Israel in the land of Israel. We left it, and it disappeared over the generations. In our times, when the social division is rampant and unity is needed more than ever, we don’t know how to show the world the method of uniting above our differences, the method that can fix not only ours but humanity’s problems. Why does the world hold a growing grudge against Israel? Since unity is a growing need, and our identity is based on being given the method to implement and pass on unity, then by not fulfilling this function for humanity, we attract a negative attitude from the world. Subconsciously, the nations of the world feel that we hold a special key for success, which we are withholding from them. On face value, it might be seen as a disproportionate power in finance, politics, business and the media, but the deeper root of these feelings, which both Israel and the nations of the world cannot yet point directly to, is that we’re expected to bring the method of correction to the world. Therefore, anti-Semitism will only continue compounding until we do. 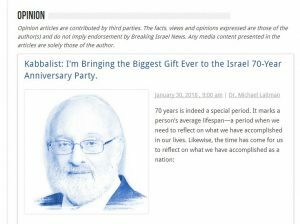 So, where’s the biggest gift ever for Israel’s 70th-anniversary party? Along with the celebration, we can add awareness of our true identity, our purpose, and role in the world. We can concentrate on what is needed in order to make progress in our ability to unite in the future, thereby adding unity to all the progress we’ve made up until today. 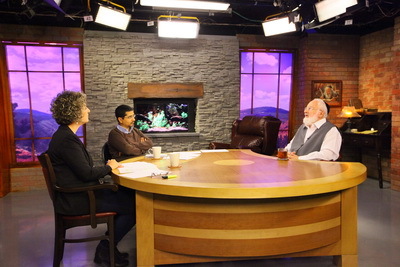 The wisdom of Kabbalah, a method for uniting people and nations, is really the biggest gift we can give to the Israeli people on its 70th anniversary, as it holds the solutions for literally all the problems we’re experiencing: solutions to unite above our internal political, religious, and social divisions; solutions to our complicated security situation and relationships with other countries and peoples; and all the way to solving our domestic and personal problems. Moreover, by uniting, the nations of the world would stop feeling that we are withholding something from them. They would start feeling an upgrade in consciousness, a positive change in their lives and the tendency toward anti-Semitism would invert: we would be treated with reverence as we would be felt as the conduit of the good that fills people’s lives. The gift is the wholeness, abundance and boundless fulfillment we can feel when the light of unity enters our lives. And the means to receive this gift is to cover all of our differences, divisions, and conflicts under a common umbrella of love. My organization, the Bnei Baruch Kabbalah Education & Research Institute (Kabbalah L’Am in Israel), will also be conducting its own celebration of Israel’s 70-year anniversary with the World Kabbalah Convention on February 20-22, 2018. The convention will be a celebration of unity above differences, with over 7,000 people attending from over 50 countries in the Tel Aviv Convention Center. I warmly invite anyone who wishes to experience the true essence of Israel’s identity, culture, and uniqueness to join us. Anyone who feels even the tiniest curiosity or attraction to the wisdom of Kabbalah or unity as a solution to any problem is welcome to attend. It is an art to be able to handle the revelation of darkness as it gets stronger and stronger. From experience, a person understands that darkness comes only in order to point him in the correct direction. He loves the darkness, appreciates it, and tries to experience it in perfection. The darkness is only felt in his egoism, while he is above it and can build the force of bestowal above the darkness, revealing the Light in it. It is a multi-layered state, like a sandwich. The darkness is revealed at the bottom. Then comes the right attitude to it—understanding that it is here to help you, that it is the revelation of a new degree—and then you have to rise above it. At first, I get scared (“You hid Your face, and I got frightened”) and try to flee the danger and evil that is revealed in the darkness. But then I stop myself, realizing that the darkness is here to help me and that I should not curse it. Just the opposite, it draws me closer to the Creator, like a frightened child who clings to his mother more tightly. The same is true for me! Therefore, I see that the darkness is help from above. I love this darkness and even want to intensify it, to draw it closer. I begin to work with it intentionally, actively, with full understanding. My life becomes constructive: Light and darkness become the two forces, the two lines, which let me progress. That is how I turn darkness into help. I await the darkness, searching for more ways to cling to the Creator. At first, I still fear darkness because it brings unpleasant feelings with it: fears, disturbances, uncertainty. But gradually, I begin to understand how helpful the darkness is because the advantage of the Light is known only from darkness. So, Light and darkness become my building blocks. The darkness becomes even more important than the Light because specifically out of the darkness I can reveal just how much I want to give pleasure to the Creator. My desire for pleasure is not inspired by darkness, while the desire to bestow is very much inspired by it. Therefore, the Adam (human) inside me rejoices in the darkness and turns it into Light. Light does not come to a person. The person changes inside and therefore transforms his opinion on what Light and darkness are. That is how he gradually reveals that creation always existed in a perfect state and that he is the one who is always changing, understanding more and more that there is no evil in the king’s palace and no darkness. Question: If a person does not have a point in the heart and does not require a conscious movement to his source, what is the matter with his calming himself with drugs? He isn’t able to do anything anyway and he is completely dependent on those with a point in the heart. Answer: I do not think that you are right. We are all inside a huge mechanism like its gears or cogwheels. Therefore, there is no one, no matter what he is, who does not rotate with everyone. Let’s say a lonely fisherman is sitting on a small island in the Pacific, making his living fishing. But if a typhoon or a tsunami comes, then he will no longer have fish or this island. Nature will not leave anyone behind, indifferent, out of work. Everyone will have to understand what is at the end of the days of this egoistic world that needs a serious “reset.” There will be no one left who does not understand this. Who would have thought 10 to 15 years ago that America would be in such a regressive state and that the oil and gas Russia lives on would gradually disappear? No one. In general, our not very reliable system of mutual unity of peoples and countries and their inability to properly interact with each other will be exposed. This is the main problem; in the global world, egoism separates us and does not allow us to conduct business as usual. How Do We Protect Ourselves From Nature? The meaning of the expression, “a light unto the nations” (Isaiah 49:6) is that the people of Israel need to provide the whole world with an example of connection above all differences. The Jews of the Diaspora are not receiving this example from the nation of Israel and they, therefore, don’t see it as a refuge. In fact, because the nation of Israel is hated in the world, the Jews of the Diaspora also distance themselves from it and are leading the line against it.